It is very easy to create a free blog on blogger platform and you can turn your free blogger into a custom domain .Please follow our step to create a free blog .This first step to make money online and boost your knowledge about online. 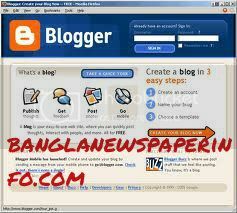 Go to Blogger .com.You must have a valid e-mail address .Now create a Google account .Then Choose a blogger and choose your domain and put your free blogpost title.Now save your blog and congratulation your blog now live and available on Internet.Very simple and easy. If like you to switch your blogger to custom domain.Just go to setting on your blogger .Look at your publishing address and under publishing option see your blogger address and a option as a add a custom domain .Now click on custom domain option and choose a domain .Google custom domain provide by godaddy.com.You have pay almost 10 Us dollar per year.